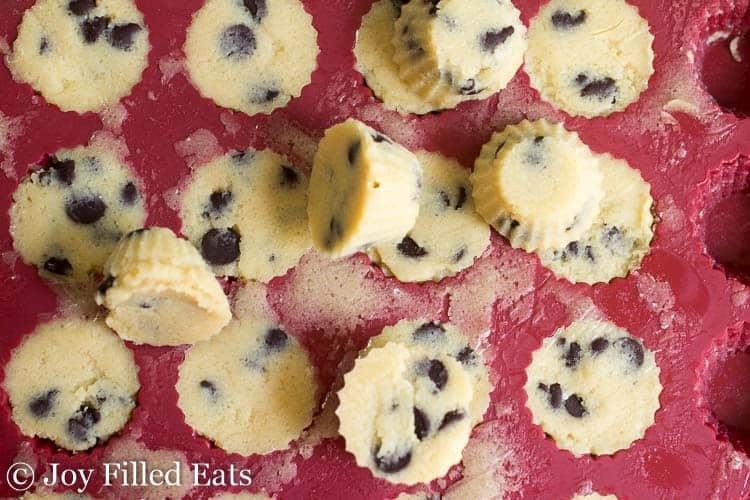 If you love cookie dough these Frozen Cookie Dough Bites will make your dreams come true. They are super easy to make and store for months in the freezer (if they last that long). 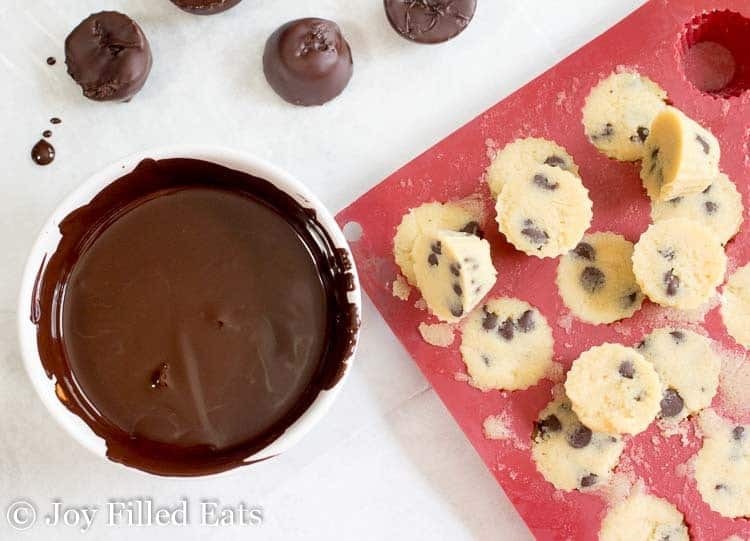 These healthy cookie dough bites are the perfect sweet bite to end your days. It’s almost summer here in New Jersey, finally, after a bunch of Nor’easters including a few inches of snow on Easter Monday, in April. We are definitely ready for warm weather and time at the pool. This is the time of year I find myself reaching for ice cream, popsicles, and no-bake desserts more than anything else. Who really wants to turn on the oven when it is 80 or 90 degrees outside? Not me. I love my no-bake cheesecakes and have a hard time deciding whether to make the cookie dough cheesecake or the berry cheesecake. Those are great for company and entertaining. 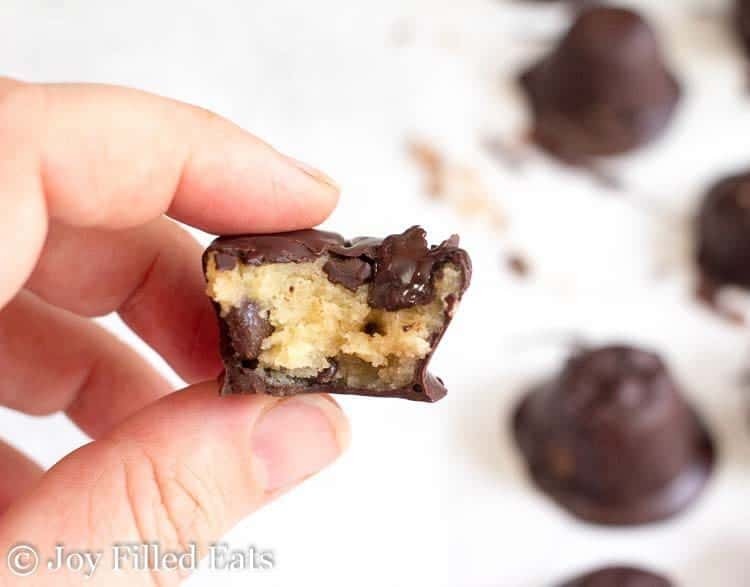 But when I just want a cool bite of something to pop into my mouth these healthy cookie dough bites are the way to go. 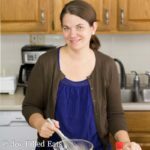 This is one of the first recipes I ever came up with in the early days of blogging in 2016. I have the photos from then but lost the little scrap of paper I wrote this recipe on. It’s been on my list to redo ever since. I went through a cookie dough phase last summer while I was pregnant so I cheated a little and just used the cookie dough layer from my no-bake cookie dough cheesecake in this recipe too. 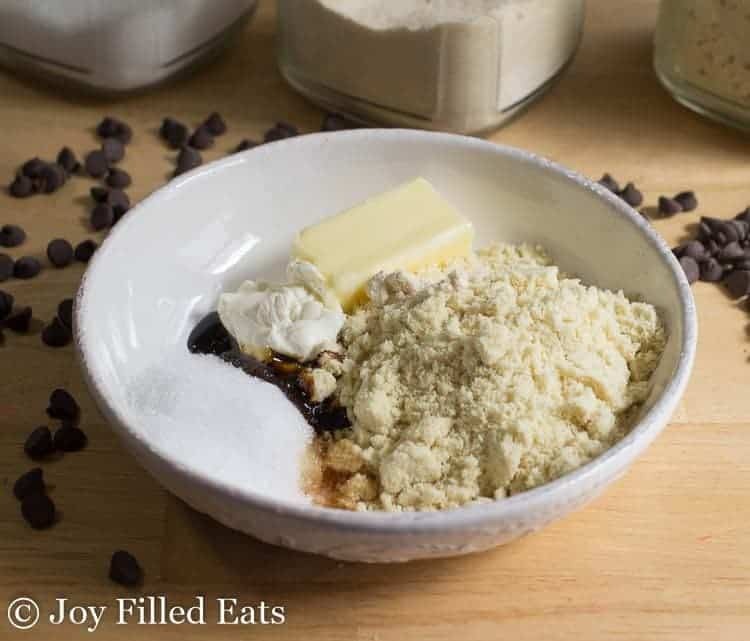 I love it in all shapes and applications but these poppable healthy cookie dough bites may be my favorite. I recommend making these in a silicone mold. 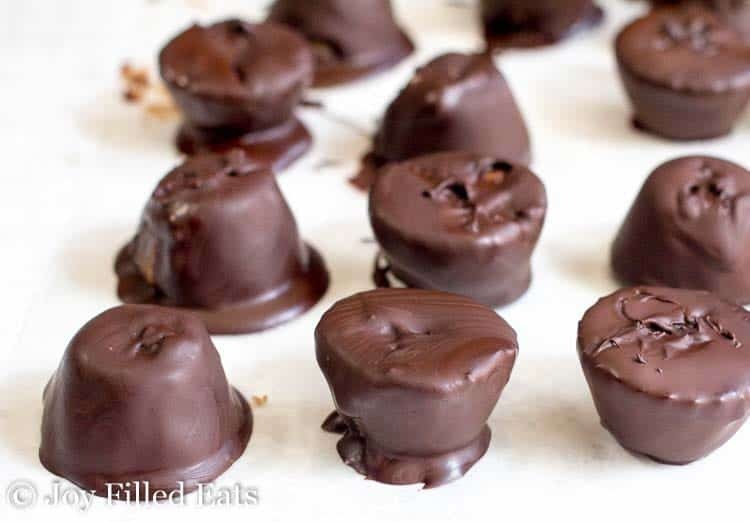 I used a peanut butter cup mold from Amazon but you can really use any size mold. You want each cavity to hold about 1/2 an ounce. If your mold is smaller you may need more chocolate to coat all the cookie dough bites. 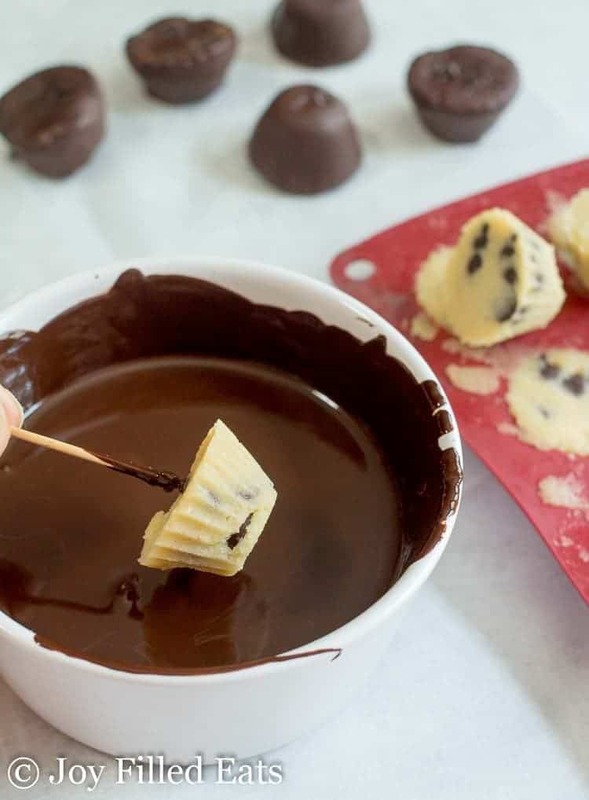 After you stir the dough ingredients together, you freeze them in a mold, and then dip into melted chocolate. The chocolate part can be a little messy but no one I know has ever complained about having to lick melted chocolate off their fingers. These harden instantly since the frozen dough chills the melted chocolate. It’s like magic. 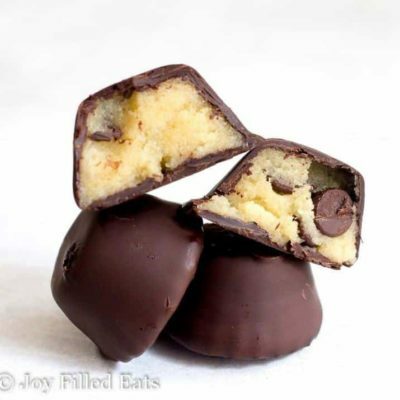 Once I’ve covered all of the cookie dough bites in chocolate I store in the freezer for that perfect cool treat. My tip for easily coating these is to use toothpicks. 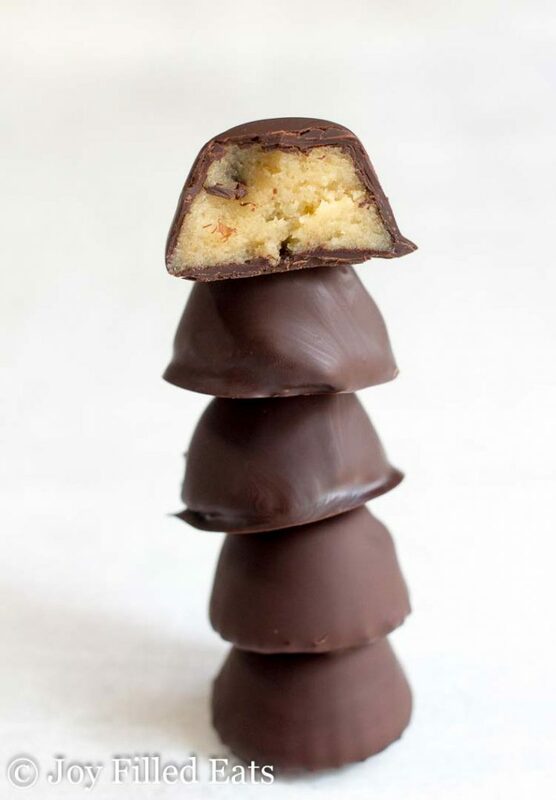 Use one toothpick to poke the cookie dough bite and dip it in the chocolate and then use another toothpick to ease it off the first toothpick. A few of them look a little messy but every last one was delicious. Just kidding. I didn’t eat them ALL today but I certainly thought about it. If you prefer you can just keep these in the fridge but I love them frozen. They are just like the chunks of cookie dough in cookie dough ice cream. No digging down the sides required. I hope you enjoy these healthy cookie dough bites as much as I did! 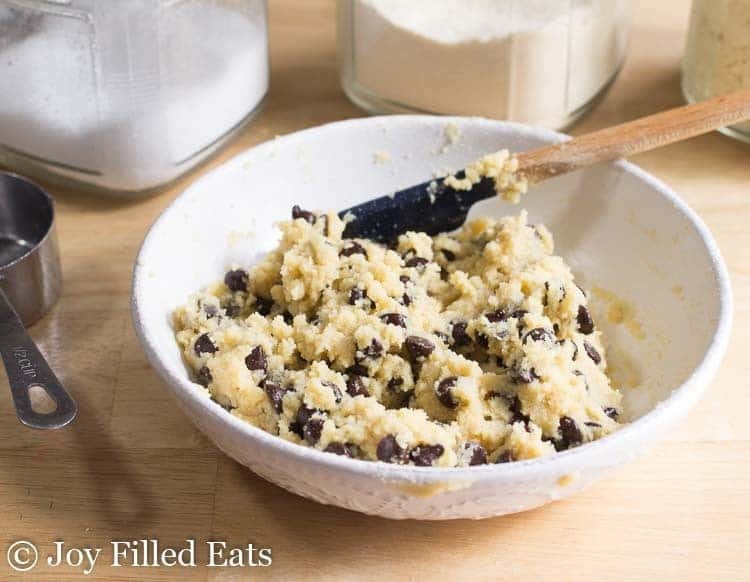 To make the cookie dough stir together all the ingredients (except the chocolate chips) until smooth. Stir in the chocolate chips. Freeze for at least 3-4 hours until solid. To make the chocolate heat it in the microwave for 30 seconds. Stir. Heat for another 30 seconds. Stir until the chocolate melts. (Heat for an additional 30 seconds if necessary). Add the coconut oil and stir until smooth. 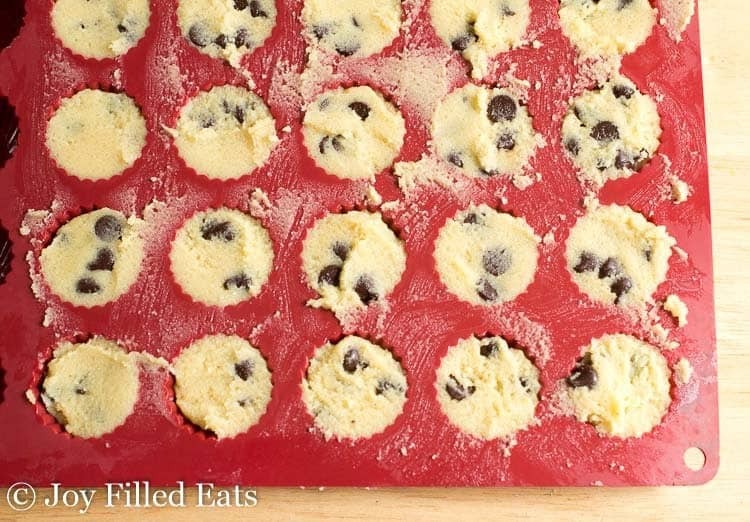 Pop the frozen cookie dough out of the silicone mold. 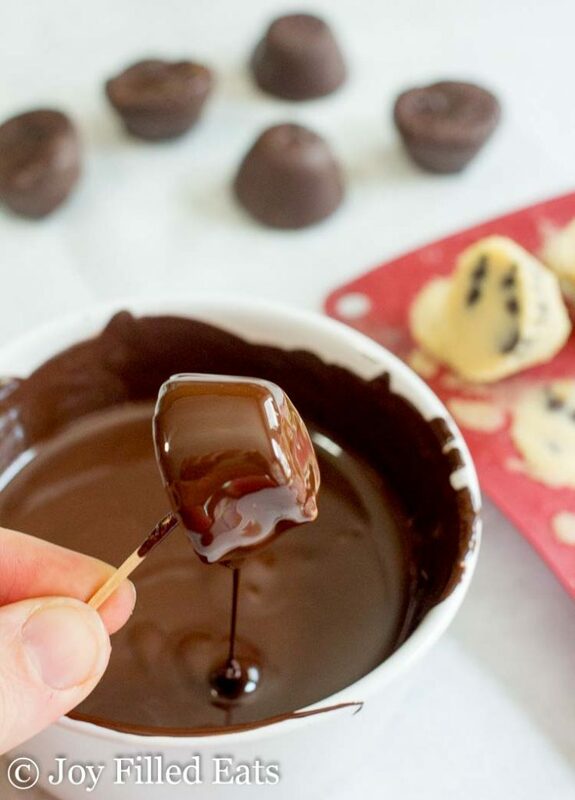 Poke with a toothpick and dip into the melted chocolate. Transfer to a waxed paper lined baking sheet. Repeat until you've coated all the cookie dough bites. Store in the freezer. I have Erythritol (Powdered & Granular) and Stevia drops but I don't have any other sweeteners. Would one of these work? I'd use powdered erythritol in the dough. You will need 1.5 to 2 times the amount listed. These look amazing. I have a coconut allergy. What could I do to make sure they are not to moist since the coconut flour is to help with that?? I know for the coconut oil I can use butter. You can just use additional almond flour. It's not a 1:1 sub. I'd suggest using sunflower seed flour instead. That tastes more like almond flour and isn't so dry. I'm not sure all coconut flour would taste good. These are amazing! I've made them twice in two weeks. I use 1/4c Swerve + 1 tsp stevia for the sweetener. Coating them gets easier with practice.Thank you for the super easy and delicious recipe! What is the sugar info on this recipe. There has to be something what with the molasses in it. There is less than 1 gram per serving so it doesn't display in the nutrition table. 1/2 tsp of molasses has 2.5 grams of sugar. Divided by 25 is .1 gram of sugar per piece. Any chance this still would taste good using an alternative to xylitol? Like using Swerve or Pyure? Yup! You can really just add either to taste. Pyure you'd use less, Swerve you'd need more. Sure! I bet they'd taste great with a little pb mixed in. I would try 2 tbsp to start and reduce the butter to 2 tbsp. You can always add a little more as you go. Could I just use 1 cup of THM Baking Blend instead of 1 cup of almond flour? Hi Chloe, I'm not sure baking blend tastes good raw. I have not tried it. I would mix a little bit with some butter and sweetener and try it before you make a whole batch. Do you think it would work to sub the almond and coconut flour with the THM baking blend? I already have that on hand and hate to buy more special ingredients. Thank you! I'm not sure baking blend tastes good raw. Mix a little bit with some butter and sweetener and try it to make sure you like it before you make a whole batch. Could you make these without the cream cheese? Lots of your thm recipes look great but I have to be dairy free. I think you can sub in coconut cream. Just use a little bit less. What purpose does the coconut flour serve? Could I skip it, since it's just 1 tsp? These sound great btw, I love edible cookie dough, but can't find a keto version I like. I hope this one is the winner!